Get Rich from the Ultimate High Rent District: Wall Street! But not the kind of landlord most people imagine. You don’t have to own anything. You don’t have to deal with late rent payments. Or the plumber when your tenant’s basement floods at 3 AM. Or Critter Control when the squirrels tap dance in the attic. In fact, you don’t EVER have to purchase one single stock. That’s right, you get to deposit rent checks – cold hard cash – into your account every single month. And since my members and I have been using this strategy, it’s worked out to be a safe, annualized income of 50.52%. I’ll go out on a limb here and say this is the top income investment on the planet. And I’ve found it pays more than most stock investing strategies, whether it’s growth or value investing. Where else are you going to get an annualized 50.52%? First, in the same time period, Stock Market Landlords get paid many times the returns made by regular stock investors. Why? 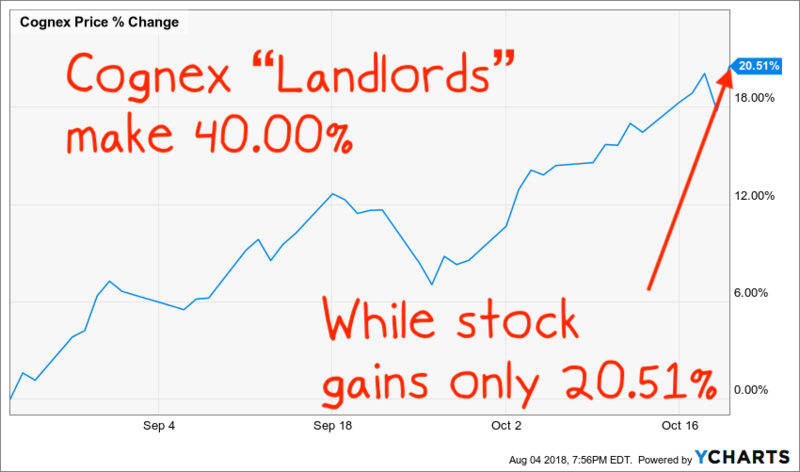 Because Stock Market Landlords will LEASE a stock… instead of buying it. Let’s do a real-life example. And let’s use 2018, because it was a tough year for investors. We cashed in on FedEx to start the New Year. A regular stock trade would have made 27.92% in just 65 days. 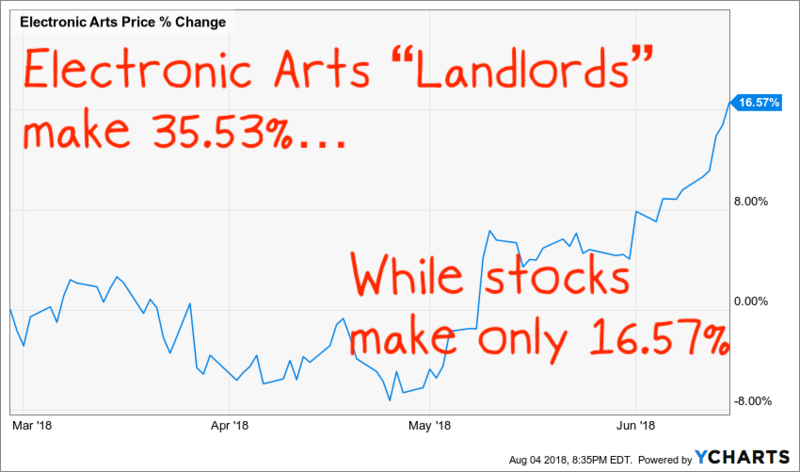 But, in the exact same timeframe, if you had leased FedEx with my Stock Market Landlord strategy, instead of buying it, you’d have raked in a 50.86% gain. Now, what do those percentages mean to you? 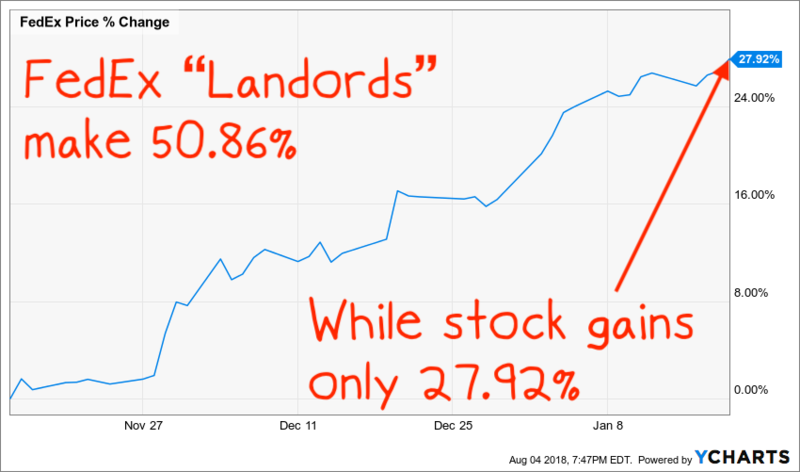 A straight FedEx stock play of $10,000 would have made you $2,792… while the Stock Market Landlord strategy would have made you $5,086. As Much Income Every Month? Also, in 2018, with Caterpillar, you could have made 21.43% in six weeks by just buying the stock. Not bad for so little time. 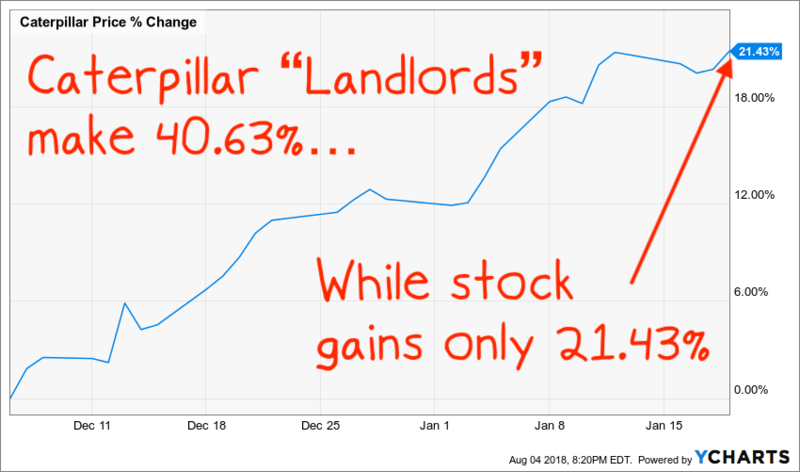 As lousy as 2018 was for most investors, it was pretty good for Landlords. 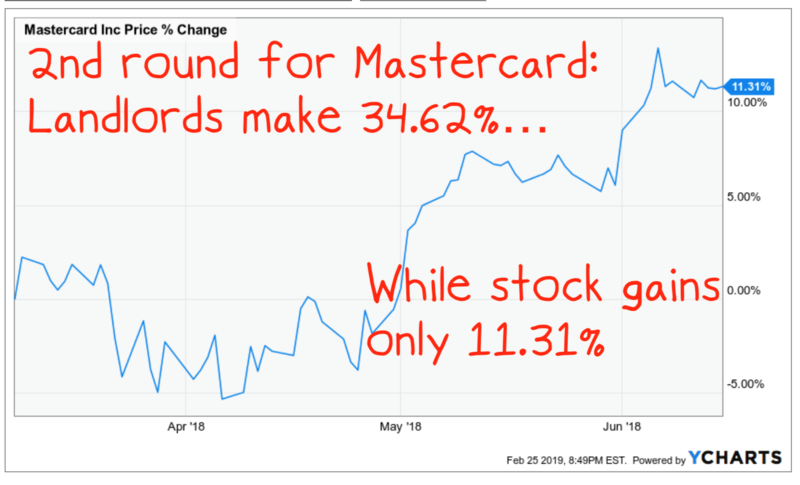 For example, most investors could have pulled in a nice 18.20% gain from MasterCard early in the year. 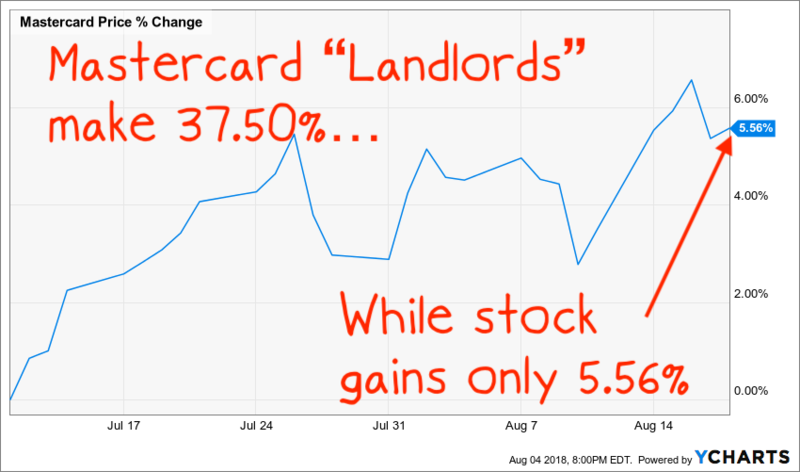 We leased Mastercard again in 2018 for a Landlord-sized gain of 34.62% in just over three months… even though the stock only gained 11.31%. 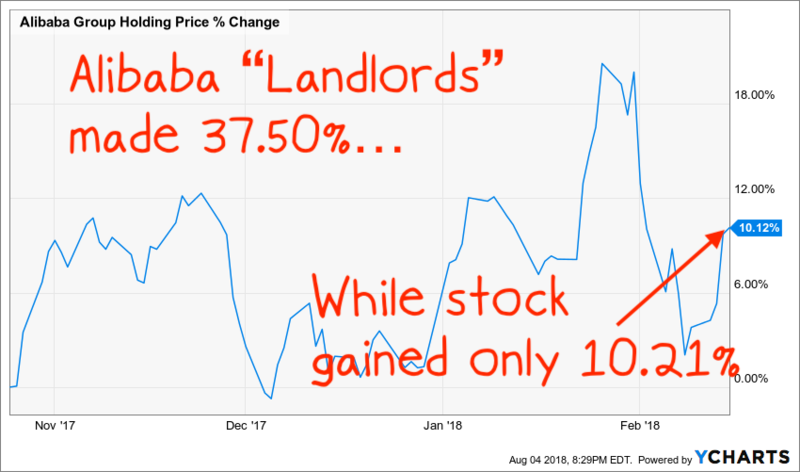 There are almost too many examples to count of “Landlording” doubling (or more) a stock’s “regular” gain. More than triple the straight stock trade. I’m showing you that being a Stock Market Landlord pays you double, even triple, the gains of the stock market. And it pays out these fabulous gains in the worst of markets, as you’ve just seen it do in 2018 – the worst market since the 2008 meltdown. But This Works in Good Markets Too! Now, 2017 was a banner year. The Dow rose 25.08%. And Stock Market Landlords cleaned up big-time. Below you can see that leasing the company Cognex made my subscribers a 40% Landlord profit. That’s almost twice the 20.51% profit made from simply buying the stock and holding it for the same timeframe. I showed you some of our successes in 2018 – the worst year since the great meltdown. But what I didn’t tell you is that our members closed out 20 investments, each averaging double-digit gains… including wins and losses. So, why did my system make such rich returns… when the Dow and S&P 500 were down for the year… and investors were losing their shirts? Because rents and leases don’t change in bad times. Landlords always make money. None of that affects Landlords like us. The rents continue to pour in. I’ve never once seen a time when rents – and rent checks – have disappeared. Mostly because you can bank these juicy gains from premium stocks like Facebook, Mastercard, and Netflix – and other “marquee” names – for pennies on the dollar. Which makes this the perfect strategy for investors who want safe, double-digit returns from brand-name stocks without paying big bucks to buy them. Bottom Line: You make more money in less time, with less upfront cash. That’s what my members did, and you can do too. Best Part: No sleepless nights, worrying if your money is safe. No worrying about when to pull the trigger and sell – it’s all done for you. My Stock Market Landlord Strategy Works on Exchange Traded Funds Too! 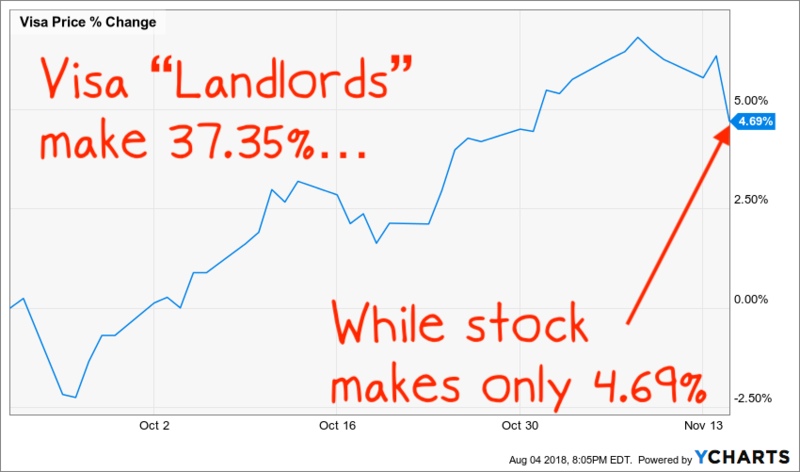 We applied my Stock Market Landlord strategy – leasing, instead of buying – on an ETF: ProShares QQQ (TQQQ). My investors raked in a 41.03% gain. Yet those who bought the same ETF realized a mere 9.28% profit. That’s more than 4X the gains regular investors would have made. So, not only does my Stock Market Landlord system beat other income investments, it can beat stock and ETF investments, too. I want to share my own personal strategy for skimming hefty cash payouts off the market each month (sometimes many payments in a month)… making you a Stock Market Landlord. Or an average of $6,449 more money in your account each month. 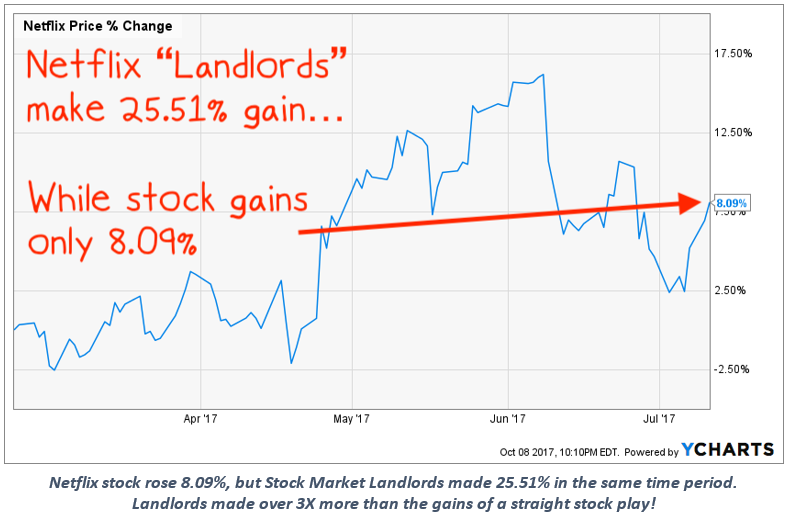 So, now you’ve read about all the amazing gains we have made… why does a Stock Market Landlord make so much more than other investors? 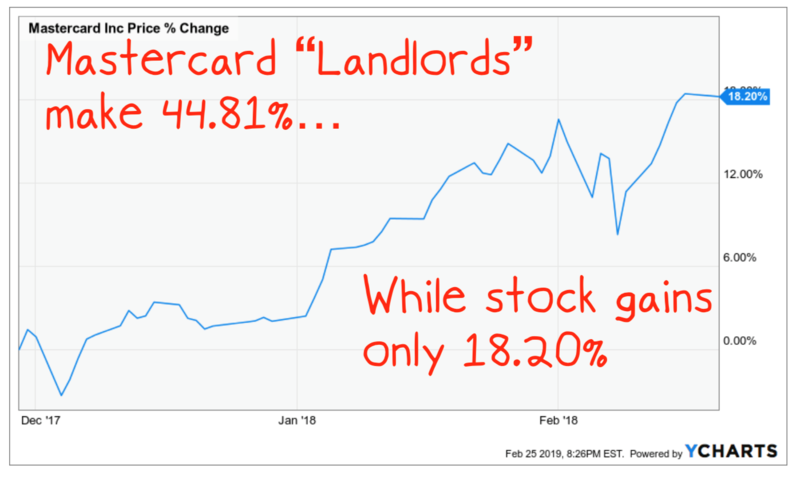 You see, when you’re a Landlord, you’re not buying the stock. You lease the stock for a year or two. And while you hold the lease, you turn around and offer short-term, high-priced “sub-leases” to crowds of eager buyers. Think of it like renting a house in a college town… and then turning around and “sub-letting” rooms to students each semester at much higher prices. That’s exactly how you become a Stock Market Landlord: You lease a stock… then sell short-term sub-leases to other investors on that stock. And don’t worry… you don’t have to be a salesperson. You simply enter your “sub-lease” information into your online brokerage account – get paid almost instantly – and you’re done. It literally takes a total of about 5 minutes. It’s probably one of the safest investments around. How safe? It’s so safe the IRS allows you to “collect rents” in many retirement accounts. And you’ll find Stock Landlording almost effortless. It only takes 5 minutes, once or twice a week. I send you an email detailing exactly what to do. You enter a few letters and numbers in your online brokerage account… and then sit back and watch the cash get deposited into your account. So, if you’re willing to do 5 minutes of “work,” two days a week… you get a 5-day weekend, and you could collect a wage higher than most Americans, according to the Bureau of Labor Statistics. But don’t take my word for it. Listen to what one of my fellow Stock Market Landlords said. Better still, Mr. Keizer’s “still growing” account puts him in a position to benefit for years to come. 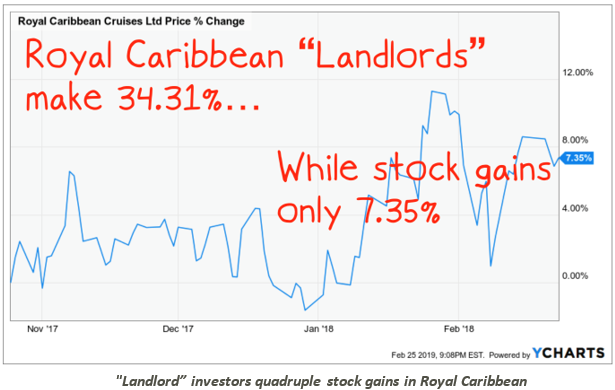 That’s the life of a Stock Market Landlord. Which is why I’m writing to you now, because after three decades of highly successful investing, it’s time for me to share with you how it feels to invest like the idle rich… and how to live like they live. Wall Street has given me this lifestyle for years… and my greatest joy in life – my biggest excitement – is when I can show an individual investor like you how to amass the same riches I’ve enjoyed. And many, many more – enough to give you a sky-high 50.52% annualized gain since this system began. Now, how exactly did we lease… and then sub-lease for these gains? It’s through a proprietary system I used as a professional investor on Wall Street – a virtually unknown strategy. But today I’m going to spill the beans on…. Few individual investors will ever discover this covert strategy. And that’s what the pros want… a nice, fat, honey-pot all to themselves. But that ends today. Now. I’m ripping the lid off this strategy, and going public. Remember earlier, I said to think of it like renting a house in a college town… and then turning around and sub-letting rooms to students for the semester at much higher prices. That’s exactly how you become a Stock Market Landlord: You lease a stock… then sell short-term “sub-leases” to other investors on that stock. Again, you don’t have to become a salesperson. Simply put up your sublease in 5 minutes… and then the internet – or your broker – does the rest for you. 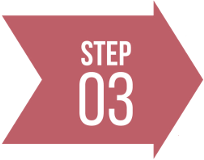 Let’s look at a real-world example, and you’ll see it only takes 3 simple steps. Without buying a single stock share! Sold the original lease for a profit. Buy a “lease” on an investment (don’t “buy” a stock!). Sub-lease parts of original lease at a higher price. That’s it! And never once did you buy a stock! 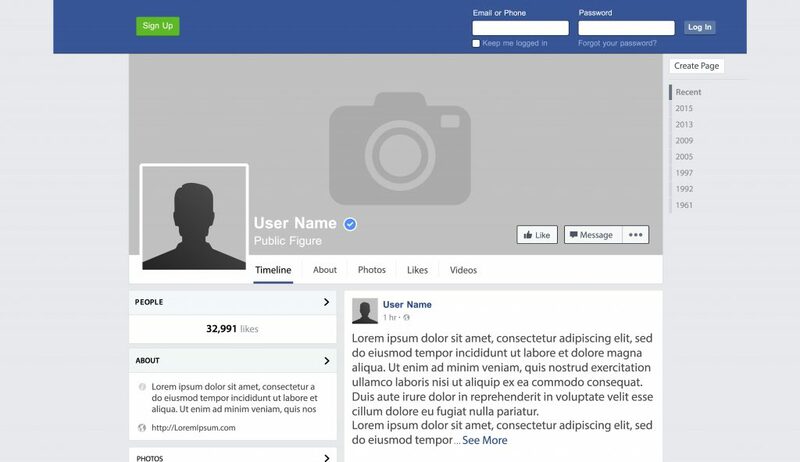 In this real-life example, we’ll start with a lease on Facebook. When we bought our lease on July 20, 2016, Facebook was priced at $121. Now, lease contracts come in blocks of 100 shares at a time. I would have advised you to lease a seven-month stock “contract,” which would have allowed you to control 100 shares of Facebook for seven months. Why lease these stocks for 7 months instead of buying them? This lease contract is much cheaper than buying 100 shares. Yet it gives you control over shares for a specific amount of time, as if you had bought them, but at a fraction of the cost. 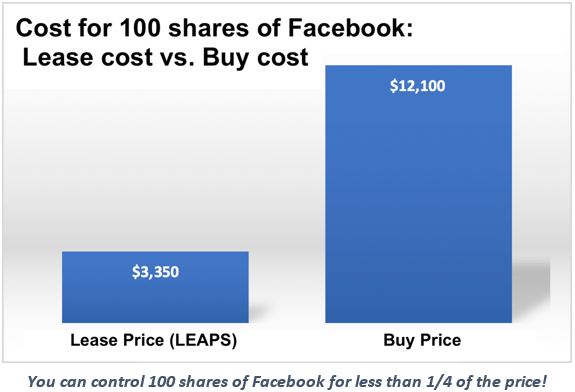 In other words, you would have paid only $3,350 to control $12,100 of Facebook stock! Now as I said, this stock contract is called a LEAPS contract. And a LEAPS contract is easy to buy. You buy and sell LEAPS contracts through your online brokerage account (or through your broker), almost as easily as you can buy and sell stocks. This is my point: For our purposes – for leasing, then “sub-leasing” stocks – there is very little difference between owning that LEAPS contract and owning 100 shares of the actual stock… except leasing costs you a fraction of the price. The name of this strategy is “selling a covered call.” It generates instant income almost as soon as you enter it into your brokerage account. This conservative strategy is like finding money in the street. You can make money with it if the market goes up or down. It increases your income and decreases risk. Remember, even the IRS thinks it’s a low-risk strategy, because they let you use it in retirement accounts. Typically, you must “own” at least 100 shares of a stock. If you do, you can write one “covered call” contract for that stock. But since you have a LEAPS contract, that’s just as good as owning 100 shares. Because you can sell that covered call on your LEAPS contract, just like stocks. It’s actually drop-dead simple – just like buying or selling a stock, especially because I email you the exact covered call contract I want you to sell, with plain-English instructions. Heck, if it got any simpler… I’d have to cash your profit checks for you! So, how much would you have actually made on the covered calls for the Facebook investment we talked about? Between July and September 2016, my members sold two covered calls, one right after the other, on a LEAPS contract on Facebook. They made $300 per contract, almost instantly. 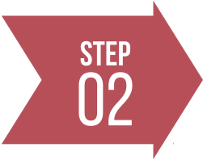 Step 2: Sold covered calls on the LEAPS contract two times for $300 instant profits each time (a total of $600 deposited in your account). Percentage-wise, that’s a total gain of 17.9% almost immediately! You would have sold your original LEAPS contract for another $350 gain. So, your total gains in less than 60 days, counting the covered calls, would have been $950. That’s a 28% return on your $3,350 investment… in less than two months! And you never bought a single share of stock. That’s the beauty of this system. Plus, you can buy as many of these LEAPS contracts as you’d like and sell as many covered calls on them as the market will bear. And, because we’re using the biggest companies in the market today, you can be sure there will almost always be a buyer for your call options. 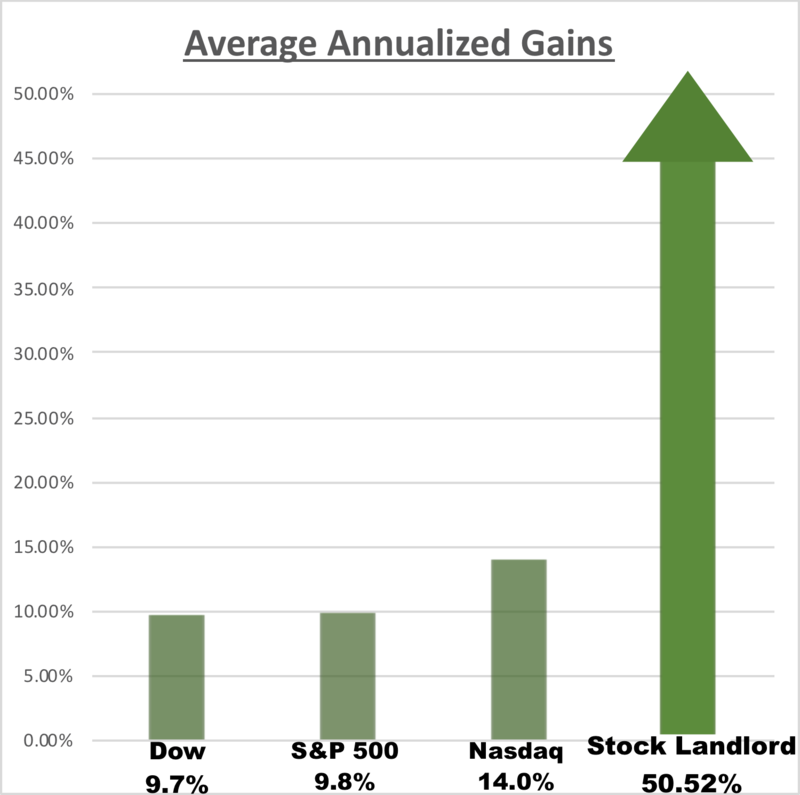 Over the last two years, readers following my Stock Market Landlord system have averaged 50.52% annualized gains. I had my friend’s 9-year-old daughter successfully enter the buying instructions into her mom’s online brokerage account. She read the instructions, clicked the mouse in her mom’s online brokerage account… and wrapped up the trade with a few hundred dollars on the spot. If she can do it in under 5 minutes… I’m sure you can too. You buy a long-term stock contract (called a LEAPS contract). You sell a covered call on that LEAPS contract and get paid almost instantly. You then sell the LEAPS contract. And you’re done. Time to move on to the next trade. My “Stock Market Landlord” Membership! 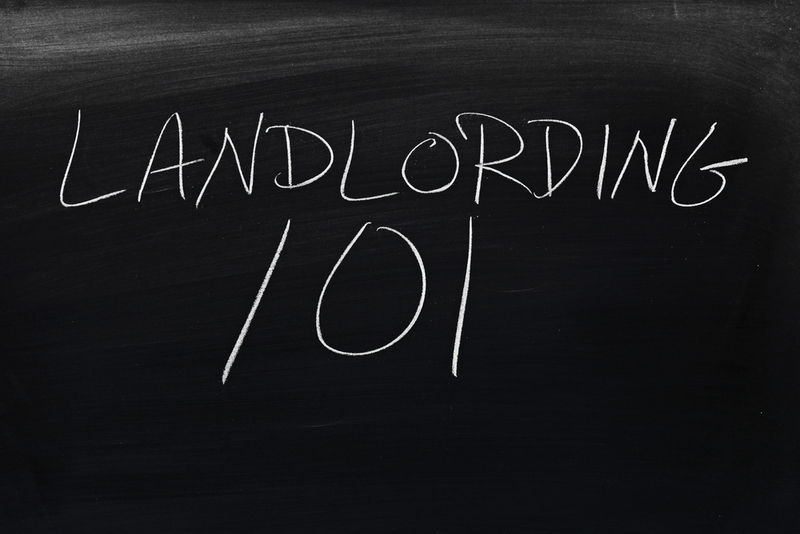 I’ve created a special service to show you how to become a Stock Market Landlord. I call it Instant Income Trader… because it takes only an instant to make hundreds, even thousands of dollars on command. It starts by me showing you which LEAPS to buy, when to buy them, then which covered calls to sell. And take 5 minutes to enter the instructions. That’s all the “work” you have to do until my next email. Go and enjoy your life. Sleep like a baby at night. You’ll know your money is safely working for you, creating a steady, predictable, and powerful income. All that is left is watching your income pour in. It’s absolutely effortless for anyone who joins my service! Instant Income Trader members who don’t want to invest $10,000 or more in brand-name stocks can still collect a big income. Giving you juicy gains from premium companies like Facebook, Amazon, Netflix – and other “marquee” names for pennies on the dollar. Use LEAPS to get the best companies at a fraction of their share price. That’s the beauty of this system. You get to play with the big boys and collect fat payments without having to use that much cash. You’ll have an average of 7-10 LEAPS recommendations available to you at any given time. This streamlined portfolio is the crème-de-la-crème of stock names in the market. These have the power to give you an average annualized gain of 50.52%, just like it has for my members. A decade from now, you’ll look back and know this was your turning point… as the day that you started living the good life. That’s what an annualized gain of 50.52% year-in and year-out gives you. Why not see this for yourself – at no risk whatsoever. Simply take a 30-day guaranteed test-drive of Instant Income Trader, where you’ll open the floodgates to high-powered income. Experience it first-hand with no obligations, and no strings attached. During your test-drive, you get all the benefits of being a member: I’ll personally give you the same trades that are currently making our members an annualized 50.52% annualized gain. You’re going to need a much bigger piggy bank. Instant Income Hotlines: New opportunities and updates land in your inbox every Wednesday, giving you cash-making recommendations like clockwork. 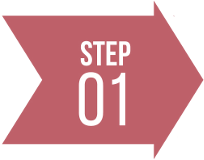 You get simple instructions for new income plays, and recommendations to optimize your income from existing plays. Urgent Flash Alerts: When a hot opportunity breaks, you get a text message AND an email recommendation rushed to you immediately, so you can take full advantage of a new money-making investment. Instant Income Trader Portfolio: You get an at-a-glance update of all your current recommendations, including juicy new LEAPS to buy, lucrative new calls to sell, and my latest instructions for each. Instant Income Trader Online Library: Here you’ll find our high-end educational videos and special reports written for my Instant Income Trader members. You also get an in-depth look at the strategies I use to deliver regular fat paydays to you. Quarterly Conference Calls & Webinars: You get direct access to me and your fellow Instant Income Trader members live, four times a year, so you can ask questions and listen to market and portfolio updates. Special VIP Access to Our Members-Only Section of Our Website: 24/7, you get private access to your Online Library, your live Instant Income Trader Portfolio, an archive of each Hotline and Flash Alert I’ve issued. This is all 100% free with your membership. I want all of these benefits to make your money work for you… Instead of you having to work at making money. That’s why I’ve gotten this strategy down to a science… and transformed it into a set-and-forget system for you. After all, the big guys on Wall Street don’t work for their money. They make their money work for them. Why not you, too? No more worries. No more work. No more wondering if you’ll last longer than your money. All of those worries end TODAY. But what’s all this going to cost? 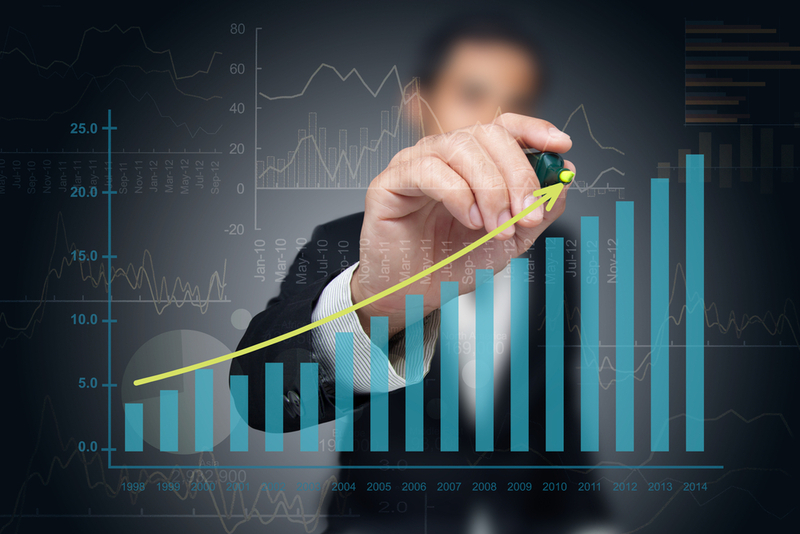 The total value of your Instant Income Trader membership – where you get access to the trades that are making us 50.52% annualized gains – is $3,750. Yet, the annual price for Instant Income Trader is much lower: Just $1,995 a year, which is well worth every cent. But if you are one of the lucky 49 investors to become an Instant Income Trader member today, you’ll get in at a special, Charter Member price. I’m willing to slash the price in half for you to only $995. You MUST be 100% satisfied in every way with this service, or I will INSIST you accept a FULL and complete refund. No strings attached. And NO QUESTIONS ASKED. No matter what the reason! And again, no strings attached, and NO QUESTIONS ASKED. Please don’t sign up for this service. You see, I’m only offering 49 new memberships. That way, I can work with our members personally. It’s all because I’m trying to help individual income investors feel the same passion for winning in the markets that I have. And it’s all about retiring in dignity with enough money to live how you want. So, go ahead and become one of the first 49 people to claim your Instant Income Trader membership by clicking the button below now. Remember, Your Test-Drive Fee is 100% Fully Refundable! I stand behind my guarantee 100%. Unless I’m positive you’ll make so much money, enough that you may quit other services you’ve subscribed to and make this your #1 income generator. You’ll never find another service like this. Not one that can give you these results. So, go ahead. Do the right thing. The smart thing for your future… your family… all your loved ones. Get started right away by clicking the button below now, while there are still open spots.